The Charles Hachadorian Award is presented annually to a non-pharmacist who has recognized the efforts that the profession of pharmacy has made to healthcare and has actively supported those efforts. Charles Hachadorian, Jr. earned his B.S. in pharmacy from the former RI College of Pharmacy and M.P.A. from URI. 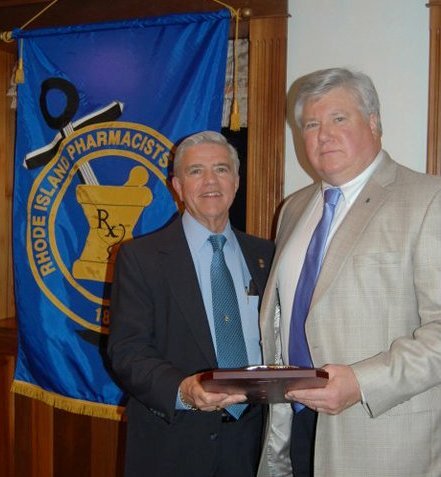 His professional career included several areas of pharmacy practice and distinguished himself as Chief, Division of Drug Control in the RI Dept of Health. He supervised a team of pharmacy fraud and drug control agents whose criminal conviction record exceeded all enforcement agencies. The Division was disbanded in a cost-saving strategy. Upon retirement from state service, Charlie served as interim Executive Director of RI Pharmacists Association until his death. The Bowl of Hygeia is the most widely recognized international symbol for the pharmacy profession and is considered one of the profession's most prestigious awards. Established in 1958, the Bowl of Hygeia Award recognizes pharmacists who possess outstanding records of civic leadership in their communities and encourages pharmacists to take active roles in the affairs of their respective communities. The award is presented annually by participating state pharmacist associations, including those in the District of Columbia and Puerto Rico. In addition to service through their local, state, and national pharmacy associations, award recipients have devoted their time, talent, and resources to a wide variety of causes and community service.